Just a thank you for the wonderful horse-drawn hayrides you provided for Browncroft Community Church! Everyone I spoke to said they were thrilled with the experience and I know that your drivers and your beautiful horses worked "overtime" to accommodate everyone. God bless you for that extra effort and I trust that you'll have an exceptionally blessed Christmas! Please give Pete and Jade an extra sugar lump or carrot for all their hard, snowy work. It was a magical evening and the jingle bells and the cheerful patience of both horses and drivers added so much to the evening. Merry Christmas!!! I wanted to say how much we enjoyed having your hayrides here with us on Saturday night. I know your horses and drivers worked hard all evening, and it was one of the most important elements of what we were doing here. Everyone thought it was great and had a fantastic time! Hi! Thank you all again for a wonderful main event for my son's birthday party! He couldn't have been more filled with joy the entire time, and I know it was such a special treat for the other kids (and adults!) Good job and thank you, Midge & Pepper! and he rode Phil. It was a great experience. I have always wanted to ride a Draft Horse. is a well known name in the community. return. Will does a great job. I just wanted to email you to say thank you again for arranging such a great lesson plan for us. The boys (and I) had a fun, educational and purposeful experience yesterday. Alenna was terrific! She was friendly, patient and informative. We are excited to have gotten started and look forward to future lessons. Thank you so much for another absolutely fabulous night!!!!! Jake was outstanding, JoJo and Lola were perfect and beautiful! We had so much fun, it is such a special time and you guys always just go along with whatever we are doing! Thanks again, see you next year! I wanted to say thank you for a great pony party on Sunday! My daughter and her friends had a great time! The parents and my family also complimented on how great the party was. The two girls that ran the party, Kate and Shana, were wonderful! They were great with the kids and really know their horse stuff!! 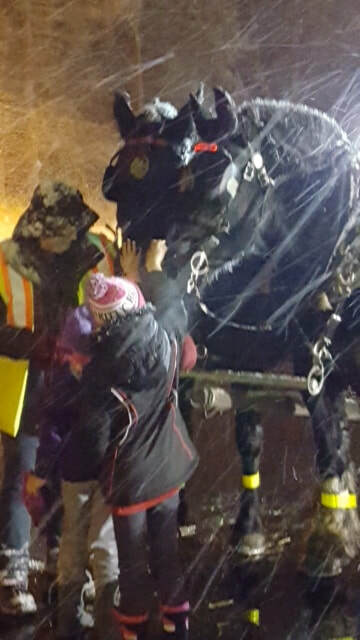 Thank you SO much for the wonderful time tonight on the sleigh ride and at the barn. It was greatly anticipated and fulfilled our expectations completely (which were quite high)! We are grateful for your gracious flexibility as we arrived a little later than intended, and also in the change of people count. I'm sure all of us girls will highly recommend Heberle to our family and friends. Merry Christmas and thank you again so much. I have been meaning to write this email all week but kept forgetting. I just wanted to be sure and let you know how much Anna and I like Eva as an instructor. She is excellent with the girls. She provides great feedback in a positive manner and all the girls in the 6pm Monday class really respond to her. She is challenging them with new skills and really paying attention how each individual performs. I want to thank everyone at Heberle Stables for another great event. The wagon rides and your horses have become a family tradition here in Chili for many people. I have attached a few photos for you. I just wanted to express my thanks for working with EMA and The Genesee Brewery on the 12 Horse event last week. The Brewery was really pleased with the event and I know a good time was had by all. I'm not sure if you have seen any of the media coverage, but The Genesee Brewery Facebook page has links to many of the stories and some great fan photos of the wagon. Just wanted to drop you a note to let you know how much I enjoyed my trail ride yesterday. Lola behaved beautifully and did not put a foot wrong. Jake was VERY patient, answering my constant stream of questions with knowledge, patience, and interest. A very nice young man and a great experience all around. I will be back. Thanks for a fun afternoon, my first horse ride in 27 years! Thank you for the opportunity for the Girl Scout troop to visit Heberle Stables on Thurs, June 9. It was a great experience for those girls who had very little experience as well as for the few that have taken riding lessons. Thank you to all of the others who helped with the event, especially Shana who did a great job instructing on the parts of the horse, tacking and untacking, and care of the horse. WOW - Everyone had an absolutely awesome time on Sunday, despite the rain. 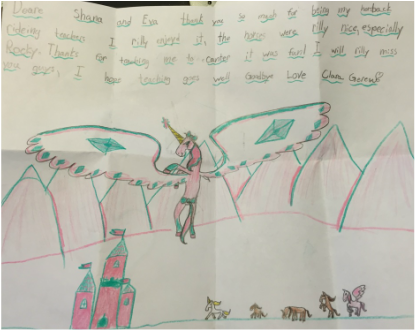 The feedback was outstanding - and the smiles on the faces of all of the kids spoke volumes. Thank you to all the girls that helped out - they were WONDERFUL! Thank you to the 2 that did a demonstration for the kids - that was COOL! Thank you thank you thank you so much!!! Thanks for these newsletters, I really appreciate them. Jenna is doing a great job with Alannah's class. The organization has been much better, they are getting out by 6:05 and Jenna is doing a wonderful job with instruction on the flat and with jumping. I'm very pleased with Alannah's progress. As for my class, I've been very impressed with Eva's ability to sneak the rails up ever higher on me - she has really increased my confidence, and I'm having lots of fun (even though I said I had no interest in jumping when I started up riding again last year!). Just a short note to let you know how much our family enjoyed our ride in the one horse open sleigh and the campfire. My sister and brother-in-law treated my husband and I and our kids and their families to the outing a week ago last Saturday. The three little girls were so excited and are still talking about Lola. It was such a fun wholesome family outing and on we will remember for a long time. The campfire, conversation and cocoa were delightful. Many thanks for the warm winter memory. Yesterday my daughter went for her third pony ride at Heberle Stables! She had a great time and just loves Nutty Buddy! So I was hoping to schedule another pony ride in December. Thank you very much for checking! We were glad to have our Zoe enter the group lesson yesterday with Eva. Somehow she manages to attend to all the girls, hold them to a minimum standard of performance and still remain kind and encouraging. We are confident that our student will become a safe and competent rider under her tutelage. The sleigh ride yesterday was GREAT!! The residents loved it…. It was a little cold, but they still enjoyed it! Thanks so much! He did a great job and we loved that he wore the coat and hat!! I'm writing on behalf of the University of Rochester Campus Activities Board, Student Activities Office, and Class Councils. We want to thank you so much for all your help with our Winter Fest Weekend, which took place on February 1-3. This was the first time we have ever done a weekend like this with a Winter Wonderland and it was, by all accounts, a huge success. We had over a thousand students come out and participate in all that we had to offer, from huskies to horses, from hot chocolate to ice carving, and from electric lights to word-burning fire pits. You and your presence were an integral part of that success and we want to extend our warmest thanks. Please keep us in mind for next year, as we plan on having the same sort of celebration of winter around that same weekend and we would love it if you would continue to be a part of that. Again, thank you very much for being a part of our Winter Fest weekend. Thanks so much for the wonderful job you did at Julie and Josh's wedding. It made it so special! The carriage was absolutely beautiful. We have lots of pictures and will be sending you copies. The ladies at the Museum were quite impressed with Bill's professionalism and the beauty of the carriage and horses. Hoping you get lots of referrals from them! Thanks again for making the day wonderful. I want to thank you and your staff for the wonderful experience Maya had at camp last week! I can't remember the names of the all the wonderful girls who worked with her. This has been such fun and she was pleased she got to ride Nutty Buddy, because she had ridden him on the pony rides last year.She wears her bracelet with "Buddy" on it and was so proud of the placque with her picture and a picture of Nutty Buddy. Her confidence on the pony and her confidence in making friends and enjoying a new experience has been a real joy to see. Maya is a quiet reserved young lady - and this time with you and your staff have brought her self-esteem and confidence to another level. I have a friend who always tells me "the outside of a horse is the best thing for the inside of a child." I couldn't agree more - and your staff is so instrumental in getting a child comfortable with an animal that is so large! Again, I have sung your praises to anyone who will listen and Maya will be back! Your program is wonderful - I hope this is something you can do several times a year for those who take a real interest in the sport of horseback riding. God Bless You All! Many thanks from a very grateful grandma and grandpa!!! "Don't Call Him a Cowboy 'til You've Seen Him Ride"
Hi, My name is Candice. I enjoyed riding Buckey yesterday. I had Bandit last summer. 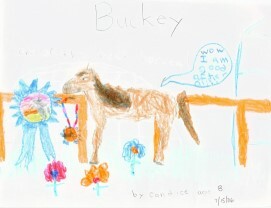 I hope you like my picture of Buckey.